This is part two of a series on my recent keynote for WordCamp Phoenix, where I took the stage in front of my local business and WordPress community to share some insights and lessons learned. The video is embedded below and in this post, I will unpack a couple of the concepts and ideas from that talk. For more insight, see part one of the series. I read this book several years ago, and it was vital in shifting how I thought about our company and how we compete in the marketplace. I was also a particularly receptive audience to the primary lesson: differentiation. I have a screw loose somewhere that has always forced me to do things in a unique way or to make something mine. Not so much as reinventing every wheel, but for some reason, I could never just do things the same way as everyone else. The gist of the book is that to succeed and grow in business, you must move out of the competitive red water and into open blue ocean. Identify an opportunity to differentiate yourself from your competitors, draw those lines with messaging and branding, and then own the new open channel you created. When we launched Pagely in 2009 we had the market all to ourselves, a blue ocean. Within a few years, there were a dozen or so competitors all saying the same things. Many of them were massive companies moving into the space, or well funded VC backed companies hellbent on growth at all costs. In this very, very red ocean, we had to ask ourselves how we were going to survive as a revenue-funded small team. We elected to seek open water and over the course of a few years we re-positioned our brand, revamped our service, and began to target a different segment of the widening channel. We left the volume driven B2C segment to everyone else and focused on the needs of value-driven B2B, higher education, media, and enterprise companies with a flexible and high-touch approach. That kicked off a multiyear run of growth for our company and most likely saved us from sputtering out. Your company’s unique selling proposition should be defined by you, not by your competition who will happily paint you into a disadvantaged position if you let them. The compelling narrative of your story can aid your buyer in selecting your firm out of many. In a side-by-side comparison of solution providers in your space, what makes your firm stand out? During my keynote I described our journey to discover and sail to new blue oceans and cited how in my mind the new block editor in WordPress v5 is an example of this process. 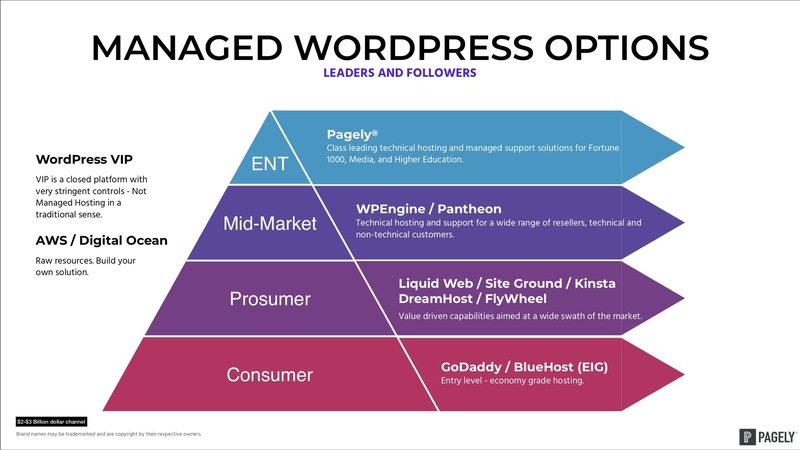 In order to stay relevant and continue the WordPress OSS dominance in the CMS space, it had to modernize a bit and seek a novel way to differentiate from a growing list of competitive platforms. There is disagreement within the community if the new block editor was the right thing to do, or was implemented correctly, but I believe something is better than nothing to keep WordPress relevant. As business owners, we always need to be thinking about the future, and a key question to answer is how we’ll stay competitive and prosperous. The last time we asked this question the answer we came up with was NorthStack, a new service we’ll be launching in the coming weeks. In the next part of this series, I’d like to look at how we empower our team to be successful. For now, please check out the video below and let me know your thoughts.